On Wednesday, we got a little cheeky and decided that we would have 14 people over for a dinner/seder. This despite the fact that our kitchen isn't yet in, and that Aaron was able to install the oven at 3 pm on Wednesday. I was a little shaky about it, because -- well, it's a huge amount of work to do a seder, and we barely have enough time to keep ourselves together. Plus, the house is in disarray, and we had to move everything out of the kitchen and living room and pack it high in the dining room to make it all work. Suffice to say, we were able to make it all happen. We got everything stowed away just in time, put together two of my long scorer tables that I salvaged from Providence College, a whole bunch of chairs (I picked up 6 more (all red) for my collection from Ikea)and I was able to pick everybody up at the train station right on time. We had a very warm and friendly night with catered food from Liebman's which, considering it was catered was surprisingly good, and a delicious apricot dessert from MyMostFavorite.com, and a pretty good Seder-- although the Haggadah that we borrowed from the Synagogue was the worst Haggadah ever-- it just didn't have a linear storyline, which was most curious since Seder is the Hebrew word for "order". We won't be using that one next year! Anyhow it was a great time (although my brother got a little extra drunk, and had a few slightly embarassing moments (nothing extreme) Nevertheless, it was good to see our house function as a social gathering place-- it does a very good job... And we've got one cabinet and our refrigerator installed in the kitchen! Hooray! 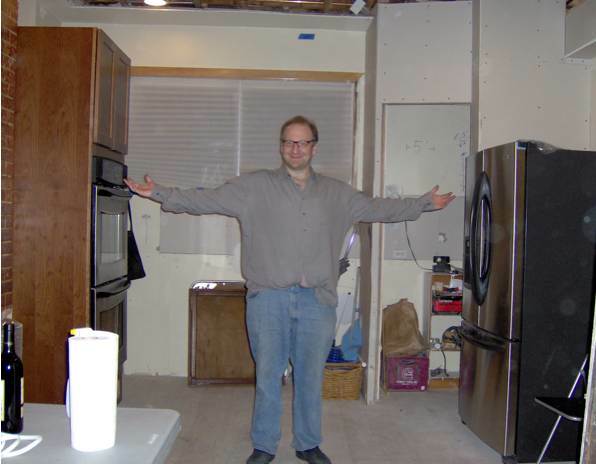 Not a very flattering picture of me, but you can see our oven and fridge in our still under construction kitchen. Comments on "Seder-- a little "order" in the chaos"